Here’s my latest essay for the Acton Institute, a review of Fr Alexander Torik’s novel Flavian. +Fr Gregory (Acton Commentary) When I first read the description of Fr. Alexander Torik’s novel Flavian, I was skeptical. Recently translated from Russian, it is the story of “an unexpected turning point in the life of Aleksei, a quite ordinary city dweller. A chance meeting with a former classmate turned much in the life of this physics-major-turned-successful-manager upside down, setting Aleksei on a new path with many amazing discoveries along the way.” I couldn’t help wondering if this was going to be simply a diatribe against business, the free market and the West. But read it I did. And what I discovered wasn’t an angry preacher heaping scorn on the unrepentant but a loving pastor offering spiritual guidance to his flock. Though he traces the conversion and spiritual rebirth of a Moscow businessman, the author doesn’t condemn business. Yes, through the voice of Aleksei’s college classmate, the priest-monk Flavian who serves as the “rector of a village parish,” Torik is sharply — and rightly — critical of the materialism and secularism that infects Russian society including business. We see this criticism in any number of places but probably no more clearly than when Aleksei makes his first confession. What are Aleksei’s sins? Idle talking and foul language, lies and broken oaths, judging and slander, gluttony, laziness and idleness, theft, love of money and stinginess, usury, bribery and accepting bribes, envy, pride, anger, remembrance of wrongs and last of all murder. 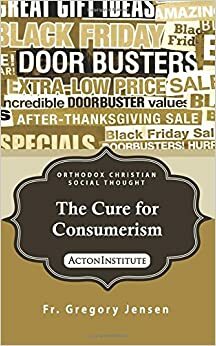 While the free market, private property and the creation of wealth are all compatible with the Christian moral tradition, there are Christians — Orthodox, Catholic and Protestant — who refuse to acknowledge this. There are Christians who argue that private property is immoral because they believe that ownership consigns a corner of God’s creation to the darkness of greed. What is often overlooked is that saying the free market is compatible with the Gospel doesn’t mean that there are no moral limits on our economic activity. While “all the earthly blessings” are from God, we need to keep in mind that material wealth as such “cannot make man happy.” True happiness only comes when we use our wealth “in accordance with the will of God … and with the law of love; for the joy and fullness of life lie not in acquirement and possession but in giving and sacrifice” (Basis of the Social Concept of the Orthodox Church, VIII.2). St. Maximus the Confessor teaches that avarice is encountered “when a man receives with joy but gives away with sorrow.” In a monastery such a person can’t be entrusted with material well-being of the community. In the secular realm, such a one hasn’t a moral character fit for business. The importance of acquiring such a character, and how to do so, is Torik’s central concern in Flavian. This is not a great Russian novel in the tradition of Tolstoy or Dostoevsky. The dialogue feels stilted, the plot forced. It is, however, a morally good novel. The novel’s underlying point about our life in Christ is sound. Repentance isn’t just about laying aside sin but also about acquiring the vision of God, about learning to see life as God sees it. It is this point that makes the novel important for those interested in Christian social thought and what it means to be both a disciple of Christ and a businessperson. ← Homily: Today is the Day!